Review: Revolution française. Emmanuel Macron and the Quest to Reinvent a Nation. Sophie Pedder. Bloomsbury. 2018. Emmanuel Macron is an “anti-Trump”, pro-European and a “liberal internationalist” who unites the centre-left and the centre-right against the extremes. He is a “neo-progressive”, argues Sophie Pedder, whose ideas are “structured around the idea of individual progress for all.” Elected President in 2017, in a run off with the far-right Marine Le Pen, at 39 years old, Macron presented a “a message of hope.” His strategy was “both a means of remaking party politics and a response to the populist threat”. Their campaign laid claim to break the existing party duopoly, and sweep away the existing “political caste”, itself perhaps a “populist” message. The Head of State’s party, La République en marche (LRM), commands 60% of the seats in France’s National Assembly. It is, like many new ‘parties’ of this millennium, including their rivals La France insoumise (LFI), is less a democratic organisation run by the members than a top-down run movement or ‘rally’. Macron, despite the Benalla affair, and the recent Cabinet resignations of ecology Minister Bernard Hulot and Minister of the Interior Gèrard Collomb, is the master of French politics. He has been, so far, able to carry out his programme. Protests, last year, against liberalising reform of labour legislation, and the railway service (SNCF), as well as of higher education, failed to have any impact. Sophie Pedder is Paris bureau chief for the liberal (economically and politically), British weekly the Economist. Largely favourable to the President, the book is unlikely to win a favourable audience amongst those who dismiss Macron as, at best, a “social liberal”. This does not stop Revolution française from being a deft and informed account of Emmanuel Macron’s life and politics. Macron, writes Pedder, is a long-standing advocate of “modernisation”. France, from this standpoint, is burdened with regulations that stifle economic initiative. As a Minister of the Economy under Parti Socialiste President Hollande, his 2015 plans (Loi Macron) to loosen the rules on shop opening hours, and rigid legislation governing the ‘liberal professions’ (notaries, pharmacists) were partly thwarted. His Socialist colleagues were to blame, including the influential Mayor of Lille, Martine Aubry, a moderate social democrat described as the “standard bearer of the Socialist left”. This experience, Pedder states, led Macron to conclude that the existing party system kept France stuck in the past. A modernising regroupment needed, “to put together two-thirds of the Socialist Party, all of the centrists, and part of the centre-right. That would give us a pro-European market-friendly majority in favour of modernising the social model.” British readers will not fail to observe a parallel electoral logic with domestic ‘centrist’ projects, however tiny the audience for making the UK social system more ‘liberal’ is. The achievement of that goal was partly due to good fortune. The “normal” Hollande discredited himself, both by his incontinent deprecation of colleagues revealed in Un président ne devrait pas dire ça (2006), and his causal deception of his partner Valerie Trierweiler. As his Presidential bid took off in 2017 his chief opponent on the right, François Fillon, became mired in allegations of financial misconduct. The Socialists chose the left-Green Benoît Hamon, without many allies beyond his own forces. With their political rivals in disarray Macron’s support snowballed. Socialists, centrists and the right, duly defected in his direction. The movement En marche soon picked up a large number of the professional politicians targeted above, and inspired a, largely middle class, army of volunteers to campaign for him door to door. Centre Left Reconciled to the Market Economy. 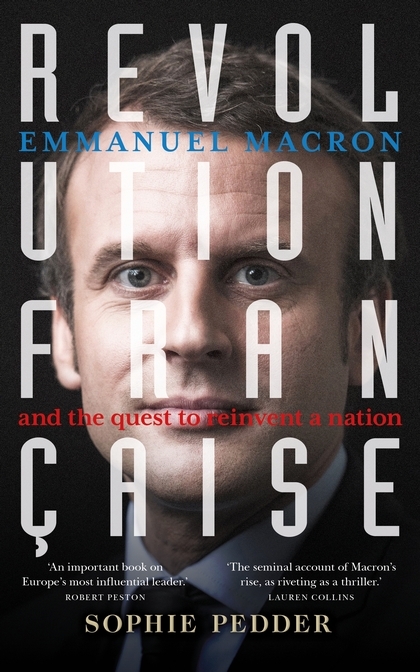 Revolution française equally offers a readable account of Macron’s ideas. Unlike the Macron, un president philosophe (Brice Couturier. 2017) Peddar does not offer a weighty list of influences, from Hegel to Schumpeter. Instead she singles out the influence of Macron’s teacher, Paul Ricœur, his Protestant humanism, and “confidence in mankind” with a dose of Saint-Simon’s advocacy of technocratic progress. Above all, “His roots are on the progressive centre left that reconciled itself to the market economy.” At the same time, noting some of Macron’s verbal tics, she observes that, “his theoretical abstractions and grandiosity came across as pompous. His sentences were convoluted, meandering and went on for ever.” One could expand further on his grating anglicisms. Will Macron, the “networking machine”, be able to change France? Has ‘liberal globalism’ found a champion who will step into the breach that has opened up after the failure of ‘third way’? Peddar signals the entrenched difficulties of a divided France, mass unemployment, those cast aside in the banlieue and “la France périperifeque”. Can Macron’s grand romantic mission turn this around? The ‘nation’ is less important than the people who live in France. There are not many grounds for hope in the recent indications that the richest section of French society is the undoubted winner of the President’s tax reforms. (Les ultrariches, grands gagnants de la fiscalité Macron. Le Monde. 13.10.18). Weakening labour legislation to the point where wage negotiations can take place plant by plant, does not look so progressive from the position of workers in enterprises cut off from national union support. Local tax changes seem designed to weaken municipal finance, not strengthen decentralised initiative. While Macron has tried to stand up to Trump his efforts have few visible effects. Defeat of the French left. The French left has yet to recover from the catastrophic defeat of the governing socialists. Hamon was fated, in the words of former PS General Secretary, Jean-Christophe Cambadélis to get the minimal score of left-greens, 6,36 % (Chronique d’une débâcle 2017). Hamon now has his own party Génération.s. The PS has since seen more defections, this time to Jean-Luc Mélenchon La France insoumise. If LFI won a respectable vote of in the Presidential elections (fourth position and 19.58% for Jean-Luc Mélenchon, in the first round) , and has, with its allies, 17 deputies, it is far, very far, from securing an alternative majority to Macron. It is unlikely this week’s pantomime response to police investigations into their funding will expand their audience and ‘federate’ the “People”. The left is now so splintered that up to 6 different lists will appear in next year’s European elections. It would appear, if one might say so from a distance, that a long-term war of position to regroup the left into some form of united front would be a better way of building an alternative to Macron that a head on war of manoeuvre. And, unlike LFI, it is quite possible to be a ‘pro-European’ radical leftist. So, a sycophantic book. I don’t know whether it includes the French corporate media claims that Macron, like French absolute kings like Louis XIV, had supposedly the power to paranormally heal sick people. It is written by somebody who clearly knows the subject in depth, and is critical of many of his ‘Jupiter’ tendencies. You can be wrong and still write a proper book. That’s enough Frog stuff. Ed. Nobody is the slightest bit interested in this Frog crap. What about the UK? At this blog post, a video in which Mélenchon, and France Insoumise but also Macron’s own party MPs, criticixze Macron for complicity with the Turkish invasion of Afrin. State-sponsored murders, extra-judicial executions seem to be catching on. They are all at it. Nobody bats an eyelid. It is the new norm. That Macron’s foreign policy stinks is hardly a subject of debate on the left, but French comrades would heartily disagree with your claims about Mélenchon, which are absurd. Here is a virulent critique of his grandstanding from the French left site Europe Solidaire Sans Frontières. vendredi 19 octobre 2018, par ARFI Fabrice, CORCUFF Philippe, PERRAUD Antoine.